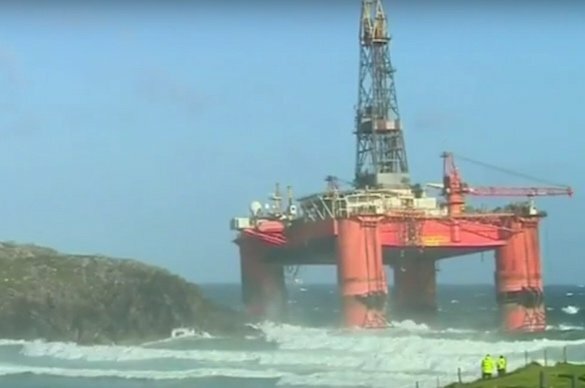 The Transocean Winner rig which ran aground Monday night on the Scottish isle of Lewis might have spilled as much as 52 tonnes of fuel, according to Hugh Shaw, the UK government’s representative for maritime and salvage. The semi-submersible rig lost its towline while being moved from Norway to Malta in very stormy conditions. The UK’s Marine Accident Investigation Branch has started an investigation into the tug, Alp Tomorrow’s loss of its tow and the subsequent grounding of the semi-submersible on the west coast of Lewis. The rig had a total of around 280 tonnes of fuel onboard when it grounded. Smit Salvage has been deployed to fix the situation and is waiting for weather conditions to improve before it starts salvage operations.